I just posted photographs and a narrative of the July 5, 2013 Pradosham as observed at the Arunachaleswarar Temple here at Tiruvannamalai. To view the posting please go to this link here. 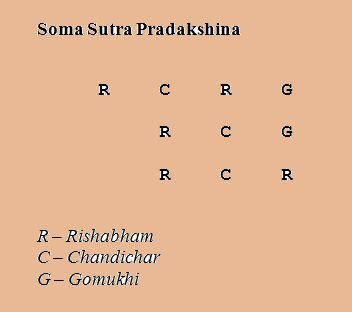 During the time of Pradosham a special type of circumambulating called Soma Sutra Pradakshina is done. During the time of Pradosham, Soma Sutra Pradakshina is the suggested method of circumambulating God. In some Temples this is always followed. In this method the gomukhi is never crossed. The gomukhi is the place where Abhishekam water is flowing Northwards. By doing this method of Pradakshina one does not step over the holy water. First saluting Rishabham Devar (Nandi the Bull) go anti-clockwise and salute Chandichar (not crossing the gomukhi). Now return in a clockwise manner and salute Rishabham and continue clockwise until reaching the gomukhi (again don’t cross). Then return in an anti-clockwise direction, salute the Rishabham again and proceed towards Chandichar. From there return back clockwise without worshipping the Rishabham and reach the gomukhi. Finally return back anti-clockwise from there to salute Rishabham Devar and continue to Chandichar and return back to Rishabham and worship the Shiva Lingam (at the altar) by viewing through the space between the two horns of the Holy bull. This is one pradakshina. Three such times pradakshina are to be done. The curve traced by doing the pradakshina is very similar to the periphery of the crescent moon. Hence this way of circumambulating is called Soma Sutra Pradakshina. Does this means salute from Nandi deva's side or back since he is facing lord siva. Thank u.
I suggest that saluting the Rishabam would be from the front with palms held together and head bowed. From the back of Nandi, it wouldn't be so much saluting the rishaba but bowing to Lord Shiva.